I an proud to participate in this years Share A Scare, from my good friends at Wittegen Press. I didn’t have time to write a story, so instead, for one day only, I am doing a free release of Daygar Legacy series. For those who don’t know, my first book was released as two books (with two more other books for a total of 4 books). The first book acts as a prologue, but is a complete story. It is free for you to read, and if you like, buy the rest of the story. The core book is only $2.99, but for Halloween, I am giving away for free. 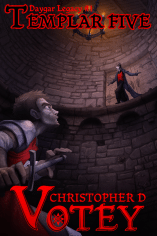 General Synopsis: Vampires in the 14th century are spreading a disease throughout Europe that are killing people by the thousands everyday, and it is now up to a group of Knights, the last remnant of the Templar Knights to stop them. But why are Vampires killing off their food source? Vampires are spreading a disease and four knights journey across Europe to seek help from an unlikely source… other vampires. But will they help, or watch mankind fall? Before the rogue vampires agree to help, they require evidence to be brought to them, evidence of an impending attack. Yet our heroes lied about it and to secure the alliance, must produce this evidence. Five Knights will travel across France to do the impossible: Capture a vampire alive. If you like either book, please consider giving an honest review. I have these books on all the major markets, but would like reviews for Amazon and Smashwords (and possibly Goodreads). Also check out my other books on my sidebar. Hard to believe, but it is finally here. I not only have finished my books, but they are now on the market. It feels amazing. This is by far my biggest accomplishment to date. The core book is about 100 pages, which is my longest book, but even the supplement that I released is twice as big as Terran Psychosis. And the release of the core book marks my 5th book published, if you include my compilation book I did with other indie writers (which I do include). There are a lot of firsts here. There is much to discuss about the process, from the original idea many years ago (the story was much different), to uploading it on Smashwords (this is the first time I’ve used Smashwords). However, this article won’t go over all of that, and I will likely discuss this to death with future articles on here and other websites. Now the real fun begins. Marketing. It’s the ugly word that writers hate. I don’t mind it so much. Once you study it and try out a few things, you can find your best method and make it easy on yourself. Just a note with #0.5. On Smashwords, you can get it for free, but on Amazon, it costs $0.99. Amazon doesn’t let you set it to free. I’ve told Amazon that it is free on Smashwords, which may update, or may not. For right now, it will remain free on Smashwords for 6 months, then be sold for $0.99. You can get an Amazon copy on Smashwords, but it requires you to upload to your own device and not use the Amazon website. Vampires are a ruthless killing machine. When they’re hungry, you are dead. But now they’re spreading a disease that is killing humans by the thousands each day. Why would a predator kill their food supply? It is up to a group of Templar Knights to seek aid from an unlikely ally, who may very well hold the secret to the Vampire Invasion. But, will they help, or watch mankind fall? Vampires have ever only been a nuisance. But now, they are spreading a deadly disease killing in the thousands. Five knights set out to stop them, five who stand as the last of the Templar Order. After meeting with an unlikely ally, they must now do the impossible: Capture a vampire alive.